Although basic skin care is essential for all of us, but once we are into our thirties, we need it the most. This is because aging skin is more prone to damage in comparison to youthful skin. The reason is quite simple and is known to most of us. With age, our skin matures and eventually loses its ability to repair and we experience a whole lot of age-related skin problems starting from wrinkles, fine lines, pigmentation to skin becoming very loose and saggy. And if you are wondering about why I am saying it all, well that’s what we are going to discuss today – how to take care of skin after turning 30 using simple best practices. In short, as we grow older, we tend to lose the charm that we once had. So, when your skin is not being able to take care of itself, it is very important for you to step up your skin care routine to keep it healthy and happy for long. You need to take special care of the skin and protect it from all the harshness around as much as possible. Trust me, with a little bit of attention and efforts, you can actually help your elderly skin to look healthy, gorgeous and glowing for long. And, if you are wondering how to get it right, then you are on the right page because today I am discussing about how to take care of skin after 30 at home. I am sharing the list of essential skin care tips for mature and elderly skin. And I am sure if you apply these remedies correctly then it will help you get rid of the many aging skin issues. Ageing is a natural phenomenon and you can never stop it. Age will obviously lead to decreasing beauty and damage to your body parts with skin being the mirror to it. But, despite it, you can definitely delay the aging process and keep your skins healthy, youthful and vibrant looking for long. To get it right, you just have to maintain a proper daily skin care routine. Slowly, you yourself will be able to see the improvements. The more you help your aging skin, the more will it be able to fight the skin aging symptoms. The skin care tips for mature or elderly skin that I am discussing in today’s post are very simple and you will definitely find many things in common probably with your daily skin care routine. But, it is just that, elderly skin requires a bit extra attention and so, you need to pamper it a little more. And these simple tips will definitely help you get it right. So, are you ready and excited to know about how to take care of skin after 30 at home? I think you are, and so let’s get started. I have seen many of my friends who are in their mid 40s complaining about their aging skin. Well, undoubtedly having a beautiful skin is extremely beneficial to look great outwardly and for everyone, having a good skin can definitely boost their confidence. Of course, if you look good, you feel good and then you are also able to overcome the bitter fact that you are slowly aging. If you are able to maintain yourself well and have that healthy glow on your skin, you can actually embrace growing age beautifully and gracefully. So, if you are among those who have are above 30 or 35 and want to look good, please follow some of these tips and remedies to take care of your aging skin. If you apply these remedies carefully and as discussed below, I am sure you will be able to take care of your skin much easily and at home. Keeping your skin clean is like the basic step you need to take up in order to keep your skin healthy. Throughout the day, our skin is exposed to so much of dirt and pollution that it needs to be cleaned on a regular basis. So, make sure you wash your skin with a mild cleanser every day once you return home or just before going to bed. As far as the cleanser is concerned, you may use a medicated one that perfectly suits your skin if you want to. Maybe you can consult a good doctor for that and get yourself a good one as per your skin type. Your skin requires a good moisturizer to stay moisturized and smooth, so you should regularly moisturize your skin. You may use the commercial one that you have been using for a long time and that which has suited your skin so far. Alternatively, you may consult your doctor also and get a medicated one. I personally like to go with the natural moisturizer that has milk, honey or aloe vera. But you can use any moisturizer that suits your skin type to keep your skin moisturized. Your body needs enough water to stay hydrated and so, you must drink enough water all through the day. This will help in flushing out of all of the toxins from your body which automatically will bring a healthy glow on your skin. Moreover, dehydration can make your skin very dull, rough and dry. But if your body is hydrated, your skin will remain soft, smooth and healthy. So, increase your water intake now if you drink it less. Here’s a detailed post on how to drink enough water throughout the day and I suggest you check this post. It is true that you will get many commercial skin products in the market. But not all of these are going to suit your skin. In fact, most of these anti-aging face masks are quite costly and includes chemicals that may harm to your skin instead of giving you the anticipated benefits. This is why I prefer using natural ingredients when it comes to skin care. Since fighting the skin aging signs is like an important concern for all of us, one of the essential skin care tips for mature or elderly skin that I would like to recommend you is to use natural anti-aging home remedies that will help you fight the aging symptoms much effectively. These home remedies are safe and cost-effective options for you to try, so you can definitely add them to your skin care routine. And here’s a detailed post that I suggest you to check to learn about various homemade anti aging face masks to get youthful skin easily. Wrinkles underneath the eyes and then dark circles, all of these are very common in mature or elderly skin, so while taking care of your skin, never miss out the skin around your eyes. It is advisable that you use a good quality eye cream before going to sleep on a regular basis. However, I would request you to choose the cream after consulting with your doctor because the areas surrounding your eyes are quite sensitive, so using any random cream might irritate the skin there. You may also use natural home remedies to fight the dark circles and the wrinkles around your eyes. It is just that since your skin may be sensitive, so do patch tests of the ingredients before using them directly on your face. Gaining body weight is very common as we age. I have seen many of my friends above 30 are gaining weight and that is not a very good sign. Well, internal and external health actually goes hand in hand, so if you try to remain healthy from inside, it will automatically get reflected on your skin. To stay in shape, it is very much important that you keep yourself physically active. You should do regular exercises for about 30 -45 minute, at least 5-6 days every week. It is not that, you have to do rigorous gym workout or anything like that but you actually keep yourself involved in some sort of workout including yoga, jogging, brisk walk etc which will help you maintain your body weight. And if you are too occupied in the morning, then you can schedule daily workout at evening, but the point is to do it regularly to remain in shape. 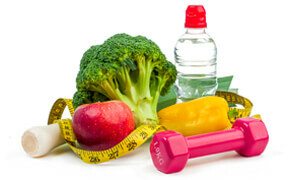 If you are able to maintain your weight and stay in shape, trust me, all the bodily functions will be going great. There will be proper flow of blood throughout your system and your skin will glow automatically. Another important way to keep your skin healthy beautiful after 30 is to give it the right amount of nutrients. You should maintain a healthy balanced diet so that your system can get all the nutrients in proper amounts to stay healthy, glowing and rejuvenated. Try to include foods that are especially beneficial in treating old age issues in your daily diet. Also, if you are suffering from hormonal issues which is quite common in aged adults, you can include foods that help in balancing the hormone levels in the system. In fact, it will be best for you to consult a good doctor to make a proper diet chart as per your body mass index and daily activities. Follow that chart diligently and maintain proper meal timings. Trust me, if you are disciplined as far as your diet is concerned, then your skin will definitely glow. This is why it forms a part of the essential skin care tips for mature or elderly skin that I would like to recommend you. The ultraviolet rays of the sun can be very damaging to your skin and this is something which is known to all of us. But, for a skin that is aging, it is more sensitive and so the sun rays can cause a lot of damage to it. So, one of the essential skin care tips to take care of skin after 30 will definitely be to provide protection to your skin from the harmful sunrays. Make sure to wear a sunscreen lotion whenever you are going out in the sun. Also, carry an umbrella with you and wear full sleeves when possible. If you are not much comfortable carrying an umbrella, then at least wear a big size hat or full sleeve clothes so that your skin is not directly exposed to the sun. Applying makeup is not bad. But one must never overdo it especially when it comes to elderly sensitive skin. This is because too much of makeup can cause a lot of damage to your skin. Excess makeup may also cause skin troubles that may not go away easily. Therefore, it is advisable that you use minimal makeup. In fact, if your skin is glowing from inside, you will actually need no makeup to look good and that itself should be your aim. Secondly, whenever you are applying any kind of makeup, make sure to wash your face properly once you are back at home. Washing yourself properly before heading to bed should be a part of your everyday skin care routine, so take a shower or just wash your skin before hitting the bed. In market you will get a lot of skin related products but I would request you to stop over experimenting with the skin care products. You never know that new product may not suit you and your skin may get reactions. Now, as it is your skin is aging and is loosely its capability to repair on its own, so in such a circumstance if you are using products that may damage your skin, then that damage may even become permanent. So, please be careful while trying out too many skincare products. Ideally you should use natural skin care products or go for the products that have so long suited your skin. May not be for all, but those who smoke, must quit smoking. Besides causing a lot of health concerns, excessive smoking and drinking can do a lot of damage to your skin as well. While smoking leads to skin darkening and wrinkles, alcohol dehydrates your system and makes your skin very rough, dry and lifeless. So, if you want to live long and enjoy glowing skin even while you are ageing, then you should quit smoking and excessive alcohol consumption immediately. And if you re a smoker and wondering how to quit smoking easily, then i suggest you check this post on quitting smoking easily. Stress is a part of life and as you age, most of the time the stress levels increase a lot which may cause a lot of harm to your skin. So, you need to fight your tensions and stay happy because only then can you look happy and glowing. This is why I thought of incorporating this in the list of skin care tips to care of skin after 30. To combating your stress, you can take the help of meditation and other relaxation techniques. Also, try out means that helps you to uplift your mood when you are down. Here’s a detailed post that I suggest you to check. Keeping yourself stress free and happy is so important for your general wellbeing as well, so you must make an effort to get rid of stress and tension. Another thing that is not directly related to skincare but definitely is responsible (indirectly) for our skin quality and health is proper sleep. You definitely need to have enough beauty sleep because it is the time when your skin and other parts of the body do all the healing and repairing work. So, unless you sleep well, you will never look fresh. In case you have difficulty falling asleep fast which is quite common with age, then you can take up natural means which will make you fall asleep fast. Here’s a detailed post with tips that’ll help you to sleep like a baby, even when you are overstressed. Over to you: what’s your favorite skin care routine to take care of skin after 30? Skin loses all the elasticity and starts looking dull and lifeless as we age. To top it up, the excessive pollution, the scorching sun rays all of them causes a lot more damage to our skin, especially after 30 years of age. When you are young, your skin may be able to combat all of this and do the repairing fast. But when you have reached a certain age like if you have crossed 40 plus, your skin even loses its capability to do all the repairing and healing on its own. This is when you got to be extra cautious and take some added care so that your skin will remain healthy and look beautiful. We have already discussed about remedies and skin care tips to take care of skin after 30. These tips are not too different from general skin care tips for all age groups but it is just that when you skin is matured, you need to be double careful regarding what you are doing for your skin. One single mistake can cause a whole lot of damage to your ageing skin and your elderly skin may not be able to overcome these skin issues easily on its own. So, it’s better to avoid experimenting with skin care products, avoid too much of makeup, keep it clean, protect your skin from ultra violet rays, eat and drink right, sleep well and so on. Eating healthy and balanced meals, sleeping well and on time, drinking enough water, doing basic exercises, all of these actually keep you healthy internally. And when you are healthy and happy from inside, that automatically gets reflected on your skin. 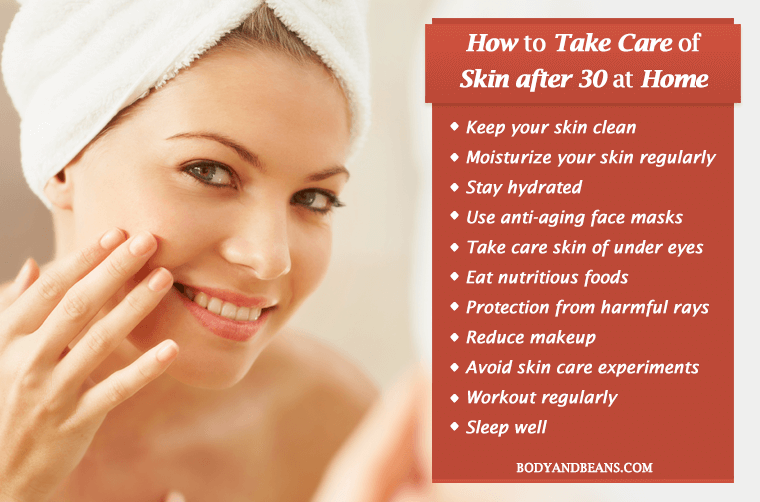 This is why I have specifically mentioned these in the list of essential skin care tips to care of skin after 30 at home. Also, remember that you can never achieve a healthy-looking skin unless you live a disciplined life. So, you need to also get rid of your habit of excessive smoking and consuming unhealthy foods and beverages. Initially it may be a thing of concern because those who are addicted to smoking and drinking find it really hard to control the temptation. But, I think if you are determined you will be able to do it. If not all at a time but definitely try to reduce it slowly. Trust me, this will keep you healthy and beautiful for long. So, that is all I had to share on how to take care of skin after 30. Simple isn’t it? If you keep these tricks in mind and follow it correctly, then I am sure you won’t have any issues in taking care of your aging skin from henceforth. However, I would definitely like to know about your experiences. How do you take care of your aging skin? What is your favorite hack to look after your skin at home that has worked for you? Feel free to share any other tips and remedies worth noting that may help in taking care of skin after 30 at home. Until then, stay beautiful, stay safe. Will be back soon with some other exciting topics.